Last weekend I completely overbooked myself but for some reason everything worked out fine. Originally I was freaking out about food. Yes food. Clearly that's all I think about. Luckily everything worked out fine. I had a full day of training at work where they provided food (Chinese takeaways for lunch!) then I bought a pre-made quiche for a hens night later that afternoon. We had friends coming over for dinner on Saturday night, luckily Mr S came to the rescue and made the entire dinner and dessert, including creme brulees, ooh la la. 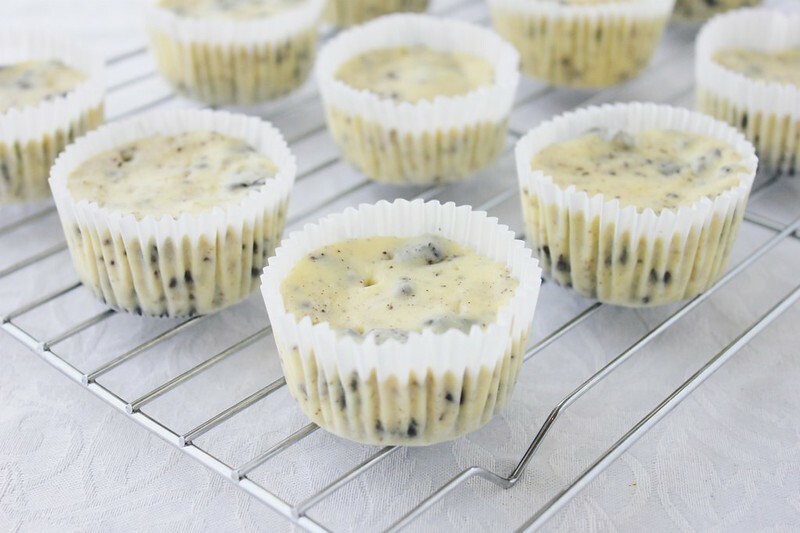 On Sunday we indulged in the most deliciously fatty fish and chips when we got together with our home group and for dessert I whipped up these cute mini cheesecakes which were deceptively easy to make! I decided last week that I would start eating healthy again once uni started up (this week), so it makes total sense to eat my body weight in bad food beforehand right? These cheesecakes truly saved me though. I thought I wasn't going to have enough time to make anything! I looked up how to make a cookies and cream cheesecake but after reading about water baths and jiggly-ness I decided it was too-hard-basket. 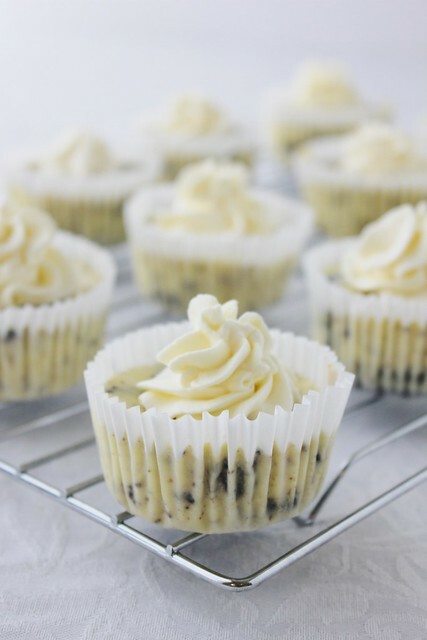 These cute little cookies and cream cheesecakes are bite sized and topped with cream which helps to offset that tangyness of the cream cheese. Just perfect. 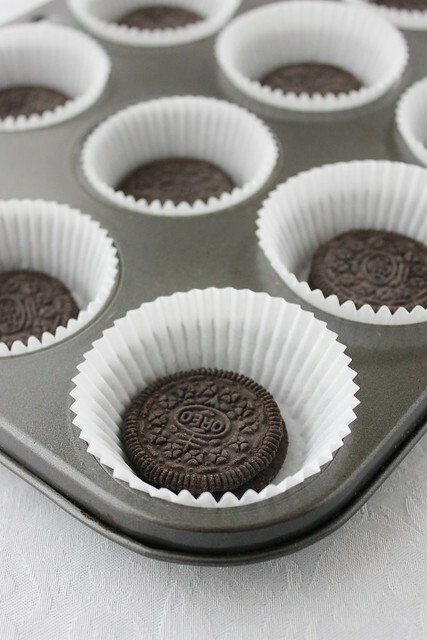 Preheat oven to 135 degrees C and line a muffin tin with cupcake cases. 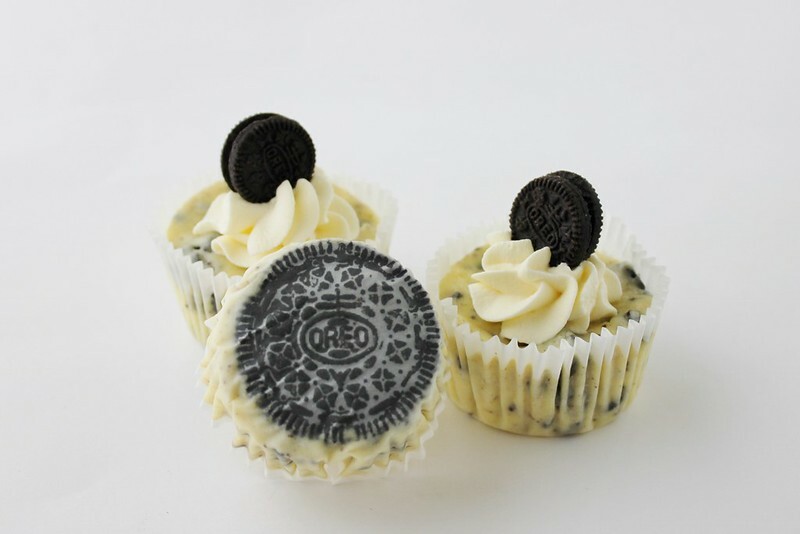 Place one Oreo in each cupcake case. 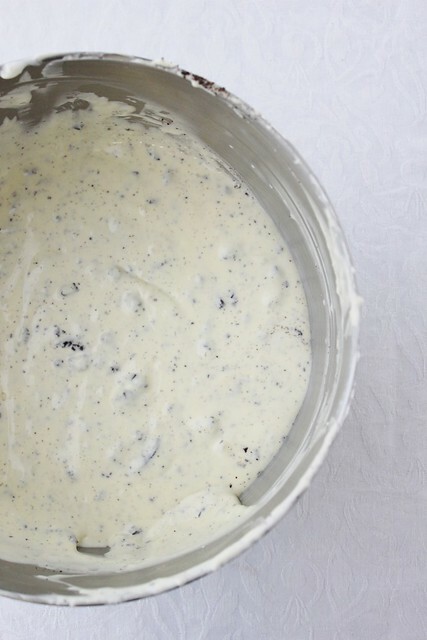 Beat cream cheese until smooth and gradually add sugar. Gradually add eggs to mixture and beat until combined, making sure to scrape down the sides of the bowl as you go. 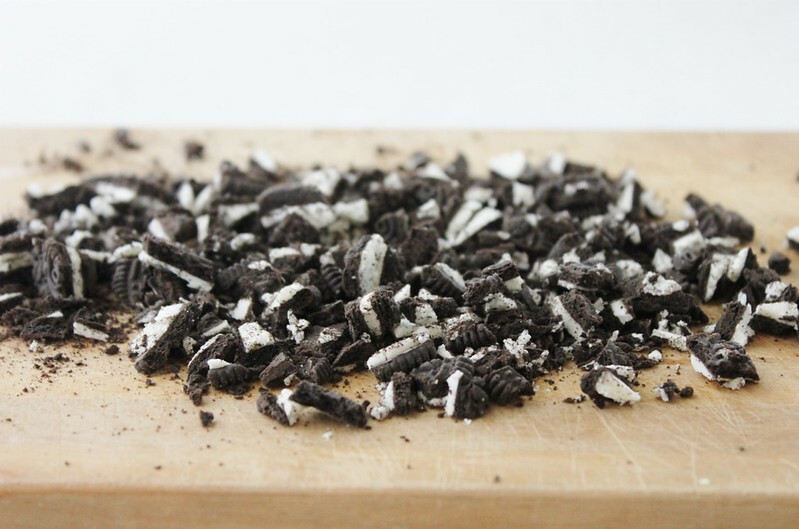 Add chopped Oreoas and stir in by hand. Spoon mixture into cupcake cases until almost full. Bake for approximately 22 minutes or until filling is set. Let cool in tins then refrigerate for at least four hours (it's best left overnight). Whip cream until it holds it shape and pipe small swirls in the middle of each cheesecake. 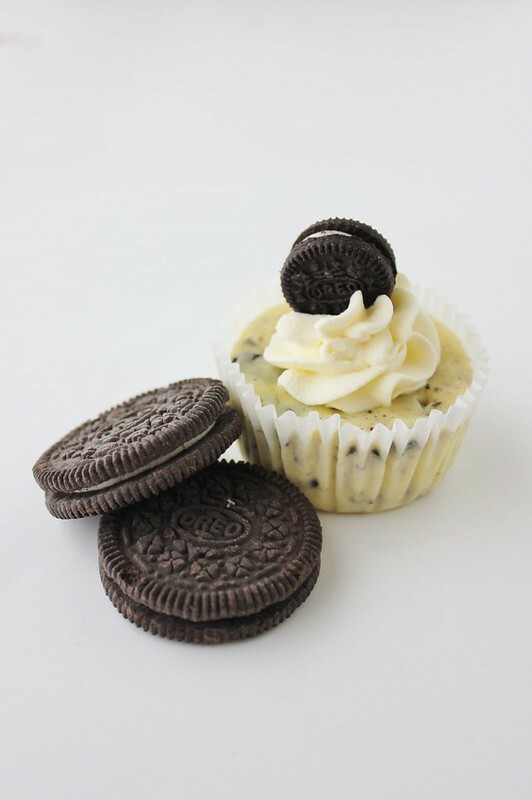 Top with a mini Oreo and enjoy! Who knows what this weekend will bring. Probably a whole lot more food, there seems to be a theme there. As it is Mothers day this weekend it'll have to involve cake. What are your plans for this weekend? Anything food related? Oh these look fantastic!!! 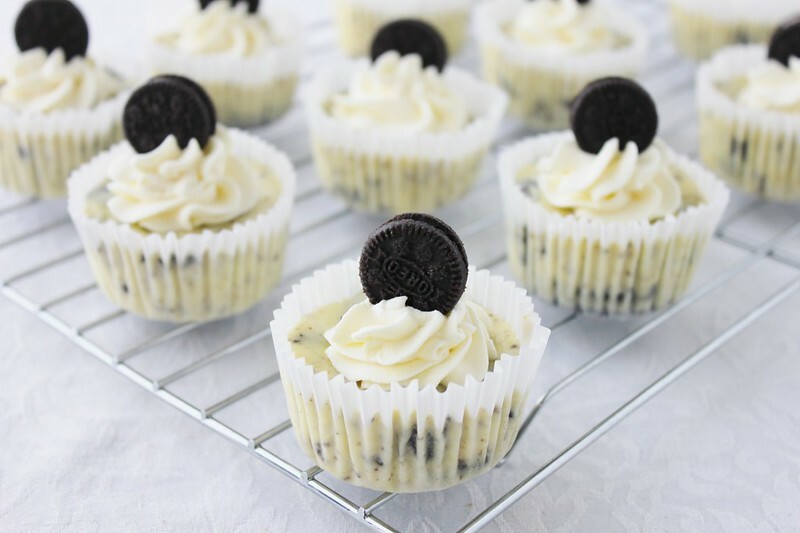 I am just curious - what cupcake liners have you used here? Just some normal ones from the supermarket, there is a pack which comes with foil liners too. The cheesecakes didn't stick to the liners which was great! I think Mr S needs to come train my Mister - entire dinner AND creme brulee! You'll be keeping him, then? 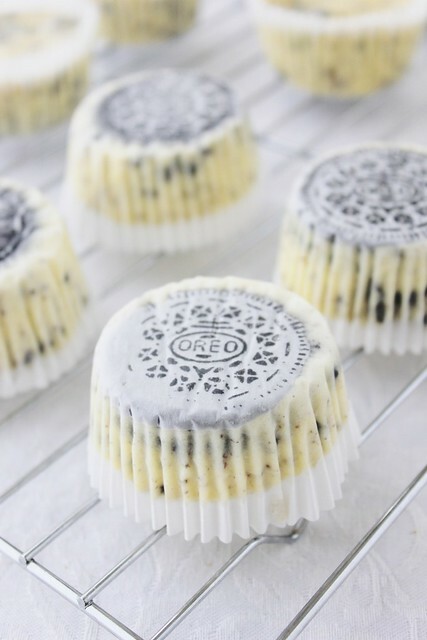 As ever, beautiful baking and great photos (and I'm not even that much of a fan of Oreos but you make them look so delectable). Very yummy thanks for posting! These cheesecakes are quite soft - next time I may keep them in the oven a little bit longer as the middle was still runny when the 22mins was up. The only change I made was that I used 1 cup of crushed Oreos with 1/4 cup melted butter to use for the base vs. a solid Oreo. Yeah most ovens are different so you will have to check with the centre is set before taking out instead of relying on the time, it's more of a guideline. Also, make sure you make them the day before so you can pop them in the fridge, then they're nice and set the next day! what is the measurements for the Sugar, Vanilla Extract, Sourcream - what does 1/2 mean? 1/2 means half, so it would be half a cup of sugar and sour cream, half a teaspoon of vanilla extract.